Get inside the mind of a recruiter. Chats about recruiting, job searches, and interviews. Ask me anything! Allow me a moment of reflection. This week, Pluralsight held its Sales Kickoff in Orlando, Florida. Over 300 individuals in the sales organization, together under one roof, celebrating the huge year we had in 2017 and planning for 2018 success. To hear the tremendous feats that we accomplished this year left me walking away from each session with a smile. What made me smile more was meeting many of the 200+ sales hires my colleagues and I have made over the last 12 months. Those individuals who made an impact in 2017. Those individuals who will make a huge impact in 2018. But, what made me smile even more was the fact that every single person we met was here for the same reason… and that energy overflowed! They all believe in what we are trying to accomplish as a company. They feel the passion that exudes from our leadership. And they all want to work together to lead towards success. The intensity is contagious! Find a company whose mission and values you can truly stand behind. It is then you will do the best work of your life. I never heard back. Why? You submitted your resume, but never heard back. Why? Before I make the decision to email/call you back, I look at your Facebook page, your Twitter profile, your blog posts, your Google+ page. I Google you. I have seen the rants about your job, how much you hate your boss, how you can’t wait for the day to be over. I have seen the, sometimes, “unclassy” pictures of your drunken stupor from last weekend. Would you hire you after seeing these things? Your grammar. Did you pass 2nd grade? If so, I expect you to know the difference between “their”, “there”, and “they’re”. Not only is this a poor reflection on you, but I risk my reputation as a recruiter as well. Your resume is hard to read. Why is it not in chronological order? How long did you work at XYZ Corp? When did you leave XYZ Corp? Why is the font so small??? Your resume is lackluster. I can tell when you just copy a job description into your resume. That’s great. But tell me what YOU did in that role. Your resume lacks information I want/need to see. You’re in sales, and you don’t tell me how AWESOME you are at closing deals? Why not? Are you not proud of your accomplishments? Things that make me go “hmm” will quickly put you in the reject pile. I had a phone interview with the recruiter, but never heard back. Why? You didn’t do your research. Tsk tsk. Always – ALWAYS – do a little reading on the company you’re interviewing with beforehand. Know what their offerings are, know who their target clients are, know what questions you want to ask. 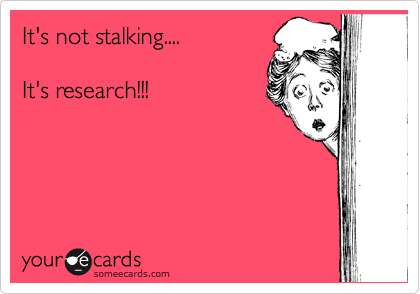 What else can you research? The recruiter. Find out where they went to school, their career history… use it to your advantage. Build rapport with them off of any commonalities you might have. You talk too much. Long-winded answers rarely get you anywhere. Why aren’t you listening to questions I’m asking? Why aren’t you answering my question directly? What are you dancing around? Nerves are hard to overcome in interviews, I get it. But you have to listen for cues. What is the recruiter asking of you? What kind of information does the recruiter need to evaluation your background? Your answers sound rehearsed and redundant. Are you telling me the same thing using different words? Have you said these sentences/phrases over and over in front of a mirror, and in every interview? We can hear these nuances. You don’t follow directions. I found you on LinkedIn, I already have access to your profile. When I ask for a resume, please send it to me. Don’t direct me back to your LinkedIn page. Not following an “ask” is a tell-tale sign of how much you want something. You interview poorly. I have said it a million times, “interviews are just conversations”. We are here to learn about each other. I talk to some candidates where I feel like I’m trying to pull teeth. Brag about yourself! Be confident in your abilities. Ask questions right back at the recruiter. Just as we’re interviewing you, interview us! I had an interview with the hiring manager, but never heard back. Why? Lack of detail. By the time you’ve gotten to the hiring manager, they are looking for details on why you’d be great at a job. If you can’t back up statements like “I’m a successful sales rep” with things like “I achieved 200% of my quota YOY by continuously prospecting my territory, fearlessly hunting and cold calling, and continuously analyzing my plan of attack”, the hiring manager isn’t going to be able to assess how well you’d do here. You didn’t send a “thank you”. Call it what you will. Some hiring managers don’t care. Some do. Some make it a “mandatory”, while others are just a “nice to have”. But, why not increase your chances by taking 2 minutes out of your day to email them? Show them you want it! Job searches are hard. Some would say, interviews are harder. They’re stressful, they put you in a position of vulnerability. Approach your job search like you would any other tough situation in life — head on! Remember… head down, chin up! Interview Question: What was the worst career move you have made? I have gotten this interview question a few times in my career, and every time I thought to myself, “Well, that’s negative, isn’t it?” But, as you take a step back and think about why the interviewer is asking it, you begin to realize exactly what they are trying to figure out. Out of college, I entered the world of sales. I was good at it and made a lot of money. I made a natural progression into Recruiting. But, there came a point where I wanted to see what else I could do. So, I left sales/recruiting and was hired as the Executive Assistant to the CEO of a biotech company. It was a role completely foreign to me, but one that I wanted to explore. I wanted to see what else I was capable of. Within a few months, I knew that I had made a huge mistake. I was miserable, and immediately started my job search. It had absolutely nothing to do with the company or the people I worked with. It was me. I quickly learned that I was a proactive employee. I like being responsible for my day. I like knowing that I will “fail” if I don’t continue to put in work. I like knowing that the work I put in today, pays off tomorrow. I learned that some people are reactive employees, and like being given projects to be done on a deadline. I was not that person. Being proactive is like a game to me. I’m competitive by nature and can’t just stand by and watch things happen. And, that’s how I landed back in Recruiting. My work is measurable and defines my success. So, my “mistake”? Going outside of my comfort zone. The real question behind the real question?… What lessons have you learned along the way? As always… head up, chin down! GOOD LUCK! Sent an email to a recruiter… and never heard back? Applied for a job… and never heard back? Interviewed… and never heard back? I can sum it up into one word: PRESENTATION. This applies to anything and everything involved in an interview process. Let’s try another scenario. You sent your resume into the “resume black hole”. Why didn’t you get a call back? I can go on and on and on about reasons why you didn’t. But, let me list the most common. 1) You weren’t a fit for the role. Did you read the job description? Do you have the required hard skills? 2) Your resume says another company’s name in the Objective. “I want to help build NOT-YOUR-COMPANY’S brand to it’s potential.” Great, good luck with that! 3) No contact information. Surprised? Don’t be. A lot of times, candidates do not provide a good phone number or email address for us to reach them. If we can’t reach you, how can you be considered for the role? Ok, one more. You got the call back! Congrats! You interviewed with the team, thought it went well, and… nothing. I will say that it is NEVER ok for a recruiter/company to not provide you with an update to your candidacy. But what could have possibly gone wrong? You thought you had it in the bag! Again, PRESENTATION. Did you research the company? Were you an off-the-wall bundle of energy interviewing at an old-school, play-by-the-rules corporation? Did you wear jeans and a t-shirt to a super formal workplace? Perhaps your thoughts were all over the place, or maybe you were a nervous wreck. The moral of the story is: presentation. Be diligent with you who present to your potential future employer. How do you want them to see you? What kind of person do you want them to view you as? What is it they will gain by hiring you? Job Hunting is Like Dating! Friends, we have all been there. The wonderful world of dating! Whether you are still courting your neighbor, flirting with every cute girl that walks into your office space, spending your time with your one-and-only (for now), or fully committed to Prince Charming… we have all “been there”. The trials and tribulations of dating teaches us so many things in life. … Like how to job search! What?! Seriously, Lianne? Yes! Let me explain. Setting standards. As in dating, we need to know what we want. If you have no direction, how will you ever find Mr. Right? Take your standards and apply them to your job search. What are you looking for? What excites you? What is an absolute deal-breaker? What are you willing to compromise on? Do you have your heart set on anything? First impressions matter. Ask anyone about what they first noticed about their partner? For fun, I asked my sister’s boyfriend and he responded, “How put together she was compared to everyone else”. Couldn’t have said it better. What is going to set you apart from everyone else? How will the employer remember you, and not the guy who interviewed before you? Desperation stinks. Who wants a stage-five clinger? Don’t be that person. Employers want to know they are hiring someone with options, not someone who will take the first thing thrown at them. They want to know they are investing in YOU and what you bring to the table. Be yourself. You want your date to like you for who you are… not who you pretend to be. In the same regard, employers want to hire YOU! Not who you are pretending to be. Facades only get you so far. Two way street. Dating is a two way street. Do you like me as much as I like you? No? Then it probably will not work out in the long run. A job hunt is the same way. While it may work in the short-term, the company has to be just as much a fit for you, as you are for them. No big egos. Big egos are a turn-off in almost any situation. Need I say more? Courting. Flirting with disaster? Luring the forbidden? Whatever you call it, you need to find a way to make them notice you! How will you do that? Wearing a big sparkly hat at the restaurant? Maybe. In a job search situation, being an industry expert certainly sets you apart. Dating. This is essential. It is where people learn about each other, where they learn whether or not they like what is under the makeup, where they determine if you fit their “standards” (see Part 1, #1). Dating is like interviewing. It’s a time for both parties to ask questions, to probe and to prodder about things that they want to know about, to find out what they love and hate about you. The Close. After a few weeks, you know you’re 100% into her. You want to spend all your time with her, and no one else. You know you’ve found the match! Now what? Close to deal. Make her your “better half”. Just as in dating, when you find that company that is a mutual fit, find a way to seal the deal. Sell them on your ability to transform their organization. What do you think now? Dating and job searching are pretty similar, huh? That’s what I thought. As always… chin up, head down! I am an optimist. I always try to find the best in people… Until I encounter something ridiculous. 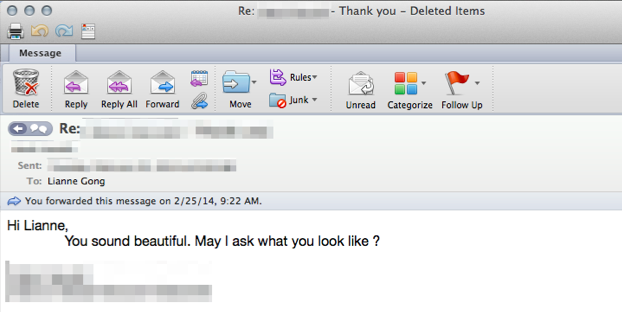 I am always surprised by what I encounter on a weekly basis as a recruiter. Hung up on his interviewer. He was mid-conversation with the Hiring Manager (HM) when the HM asked a tough question about management, who he works under, etc. Understandable question since HM used to work for this candidate’s current company. The candidate must have been terrified because he quite literally hung up on the HM, and was not reachable after that. Was misleading about their employment. As mentioned above, the HM had previously worked at the candidate’s “current” company. I put current in quotes because the candidate was no longer an active employee. Naturally, we (recruiters) will find out as much as we can about a candidate through means of our own. As I’ve mentioned in previous posts… We know people, who know people. Hit on the recruiter. Check out the final email I received (below). This is not ok. Ever. My advice? There is a way to bow out of an interview (or anything, really) gracefully. Don’t burn bridges; you never know when you will need that network. A colleague of mine called me this morning to ask for some insight as a Corporate Recruiter. On what? On LinkedIn and how we (corporate recruiters) see a candidate’s profile. She wanted my insight since she comes from the Agency Recruiting side — a WHOLE different ballgame over there. Q: What do you look for in a candidate’s profile? A: I am looking for completeness. I want to see a full name, where you are located, what industry you’re in. I want to see accurate dates of employment, where you are/were employed, and what you did/do at your place of work. I want to see a picture; I want to see a human face behind these words that are on their profile. Above all, I want to see a story. I want to know how they got to where they are today. Q: Anything else you look for? A: Oh yeah. I want to see recommendations from colleagues, managers, people who have interacted with them. If their LinkedIn network is small, I tend to second guess my reaching out to them – at least via that medium. Their college degree(s). Q: What pet peeves do you have about some LinkedIn profiles? A: Where do I start? Why do people think that by hiding their names, they’re doing themselves any good? I guess, unless they don’t want to be found. But professionally speaking, why wouldn’t you want to be headhunted? Also, I understand why one might refuse to disclose their current company’s name, but why must all the companies in your profile be anonymous? What is the point of that? All job titles and no job duties. This doesn’t help me! Help me, help you. Q: What do you think about LinkedIn Groups for networking? A: They’re a GREAT networking tool. I don’t know why more people don’t participate in them. Not just to be members, but to be contributing members. Engage with the folks in the group. Ask questions. “Networking” isn’t just handshakes anymore! Q: How many resumes do you review daily that come in from your ATS (Applicant Tracking System)? A: 30-ish per position, daily. Q: How many positions do you normally hire for at any given time? A: On average, anywhere between 8-15. Q: That’s a lot of resumes. How many profiles do you review on a daily basis via channels like LinkedIn, Twitter, Facebook, etc? A: I’ll look at about 500 daily, in addition to whatever resumes came in that day. Q: How do you have time to read all those resumes?? A: Read? I skim. I’m scanning for the most important pieces of information that I need to make this person qualified for the role. If it’s not on their profile/resume, I’m moving on. Definitely under 30 seconds per profile/resume. So, if they want to be “seen”, they have to make sure they have the information we’re (recruiters) are looking for. A: No, I don’t think so. Nature of the beast, I guess. Dog eat dog world. If you want it, make it happen. I find that a lot of “job seekers” lackadaisically go about their job search. They tirelessly send resumes and are upset when they don’t hear back. They want to be headhunted, but their online presence is minimal. A little fine tuning will do wonders! I have faith in you. Good luck! And as always… I’m all ears!